Members enjoy 40% off mains and free beef crisps. Try a delicious dish from the new Beefeater spring menu. Maximum party size of six people per visit. 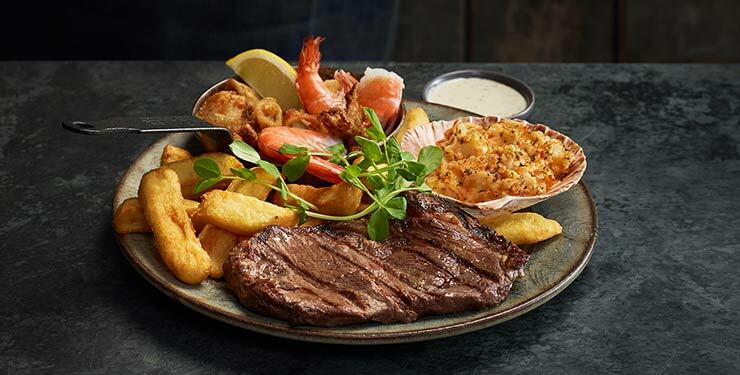 Visit Beefeater for a taste of their deliciously tender steaks and as a Possibilities member you can enjoy 40% off mains, as well as a free portion of beef crisps for the table when dining from the main menu. This spring why not try a delicious dish from the new Beefeater menu, which celebrates the best ever creations which have become firm favourites since the restaurant first opened its doors in 1974. Great news, this offer has been extended. If you claimed your code before 8 April, please claim again for your new code. An email will be sent to you within 30 minutes. Simply present the code to a member of staff in the restaurant to enjoy your discount. 1) This offer entitles the holder to 40% off main meals. Only one code is required per party, maximum of 6 per party. Drinks purchased will be charged at full price. Minimum purchase of two main meals is required. 2) All set menus, Daytime Saver Menu, Evening Value Menu, Kids Meals, Breakfast and Premier Inn Meal Deals are excluded from this offer. 3) This offer is valid from Monday 1st April to Thursday 9th May 2019. 4) The code cannot be exchanged for cash, is non-transferable, must not be reproduced, copied, varied or used in conjunction with any other offers or the Whitbread Privilege card but can be used in conjunction with loyalty points-based vouchers only but not Loyalty Celebratory Offers. 5) All rights remain with the promoter who reserves the right to withdraw the offer at any time and without prior notice. 6) This offer is not valid at the following sites: Beefeater Bar + Block. 7) This offer is only available to Saga Possibilities members. 1) This offer entitles the Saga Dining Possibilities member to one portion of beef crisps free when member is dining from the main restaurant menu in conjunction with a Saga offer e.g. 30% off mains. 2) Only one portion of free beef crisps is available per table. 3) Minimum purchase of two main meals is required. 4) Key date and Seasonal Set Menus, Daytime Saver Menu, Evening Value Menu, Breakfast and Premier Inn Meal Deals are excluded from this offer. 5) This offer is valid from Thursday 25th October 2018 to Wednesday 11th September 2019 inclusive. 6) The offer cannot be exchanged for cash, is non-transferable, must not be reproduced, copied, varied or used in conjunction with the Whitbread Privilege card but can be used in conjunction with loyalty points-based vouchers only but not Loyalty Celebratory Offers. 7) All rights remain with the promoter who reserves the right to withdraw the offer at any time and without prior notice. 8) This offer is unavailable at the following sites: Beefeater Bar + Block. 9) This offer is only available to Saga Possibilities members.